If the official world of maps has mutated into an insane apparatus of surveillance and control, why should communities use maps to make land tenure claims? Maps historically have been used as instruments of the state. Through counter-mapping, communities can appeal to the state's values. By doing so, they hijack cartography to make themselves visible and more difficult to dismiss. Using these principles, The Craft Market in Nsambya (pseudo name to protect the community) and I collaborated to build a map that would serve to stall eviction by the state. The end goal was to gain time so the community could organize their next steps, while creating a dialogue around urban planning and the displacement of communities in the developing context. Geographic Information Systems (GIS) display geographical data in a manner which allows people to trace patterns and reveal trends. With the advent of Digital Media, search-engine-based GIS like Google Maps have proliferated for its ability to pinpoint commercial establishments and its user-friendly interface. "Google Maps offers live, shifting representations of a complex interplay between utility and constantly changing contexts, content and commercial ambitions in one of the world's fastest growing, most lucrative markets. More than a map, it is a kind of 'macroscope'; a tool set that makes sense of a system we are using on the outside while changing from within"(Schulze). I personally have multiple critiques regarding the Google Maps platform and the way it shapes a person's experience in a space, but my biggest concern is what information is being displayed, not how the information is accessed. Google Maps oozes an aura of authenticity and credibility that makes it hard to question the information it displays. Partly because the photographic elements seem to be miniature pieces of reality anyone can make (Sontag) and partly because of the companies' emphasis on data collection. Information is shaped by the company's intended commercial goal. Google's mission is to organize the world's information and make it universally accessible. In "Ten things we know to be true" they acknowledge this is to be a monumental task. They state that researchers at Google continue looking into ways of providing all the world's information to people seeking answers; they are working hard to consistently incorporate information that was not readily accessible before. But when your core interests are companies, what information becomes important and how does it get prioritized? Google's position is that they are a business first. Their revenue comes from the sale of highly targeted text ads displayed along the searched query. Another source of revenue is offering their enterprise solutions (Google Apps, Google Earth & Maps, and the Google Search Appliance) to companies and to different government agencies around the world. Google's image of The Craft Market. It is not tagged. If Google thrives to make information accessible and Google Maps is a kind of 'macroscope' that helps consult places in a space, then what happens to the places and people that are not business? How can mapping be free from the tyranny of the state and from big corporations to bring visibility to small business and communities that do not fall in line with the macro scale? This is where counter-mapping in the form of Indigenous Mapping and "Community Satellites" come in. Indigenous Mapping allows a community to ensure that their geographic qualities and boundaries are visible, especially in disputes of land tenure by engaging the community in the map-making process. Bernard Nietschmann, an advocate of Indigenous Mapping, in the text "Defending the Miskito Reefs with Maps and GPS: Mapping With Sail, Scuba, and Satellite" suggests that Indigenous Mapping "...helps authenticate traditional territory, calls into questions a central government's assertion that indigenous people don't have a land or a sea territory, and serves internationally to promote greater self-determination" (Nietschmann). They help to apply social force to the government against disputes over land tenure. 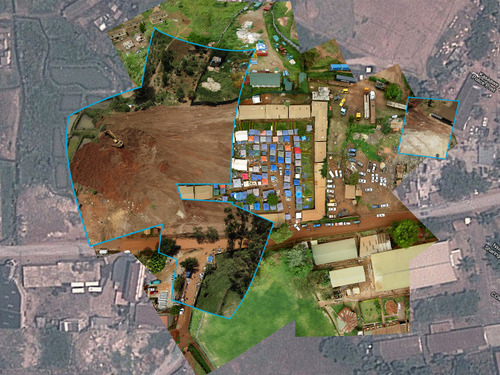 When I met The Craft Market in October 2012, they had already decided that mapping was the best tool to make claims on their space and document other areas already evicted in Nsambya. Using their expertise, they created hand drawn maps of the Craft Market and surrounding areas. But even though their hand drawn map was geographically correct and documented their placement, it failed to document the 800-person workforce in the market. 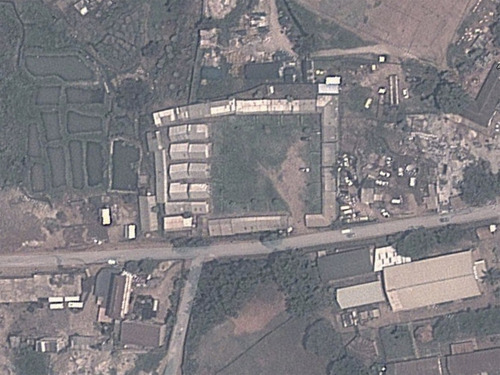 Similarly, Google Map's satellite image of the area did show the market, but there were only images captured when it was empty. In addition, it was not tagged as The Craft Market. This is when appealing to the state's values by using photographic evidence became key. By amplifying the resolution of their map we could question both the state claims on The Craft Market's importance while subverting the Google Maps representation of the space. Groups like Grassroots Mapping (The Public Laboratory) have set out to develop open-source tools like the 'community satellite' that invert the traditional power structure of cartography. 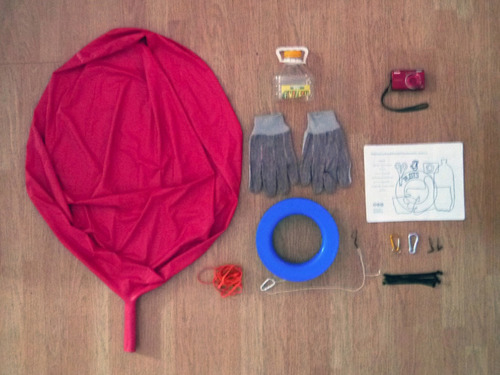 'Community satellites' are built by combining helium balloons, household items and inexpensive digital cameras in order to achieve high-resolution aerial photography. 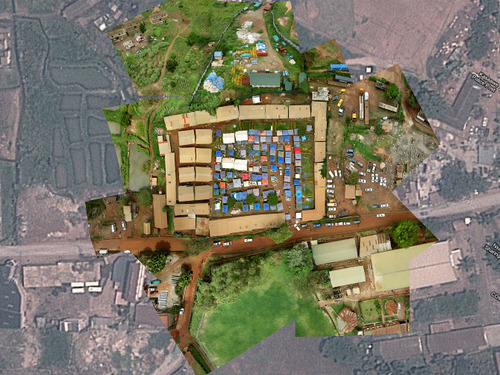 By lowering the access cost of aerial photography, 'community satellites' can be used by communities question the subjective nature of mapping as a medium of state control. Using their kit, The Craft Market and I set out to amplify the resolution of their map to make their claims more sound. 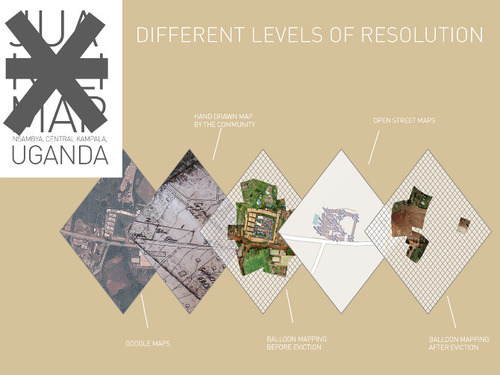 The goal was to combine the bird's-eye view of aerial mapping with the bottom-up approach of community stories to enable multiple narratives of place to be visible and relevant. Resulting photographic map with the middle stalls. Users of Google Maps are not able to actively shape the maps displayed. 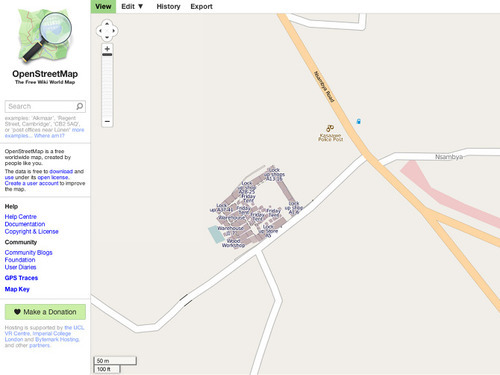 Instead, we release the photographic map to the public domain through an open-source GIS, OpenStreetMaps. Google Maps sometimes takes information from OpenStreetMaps of areas they are not able to constantly update. This way The Craft Market and I were hoping to affect Google Maps while shaping their online presence in a method that was relevant to them. The Craft Market's agency and the aerial mapping managed to stall the eviction through different structures. It stalled the eviction legally for a month when the community, using the map, acquire a court injunction. Also, they sent letters to several different government agencies. The map proved to the Ministry of Tourism that they played an important role in the tourism industry. 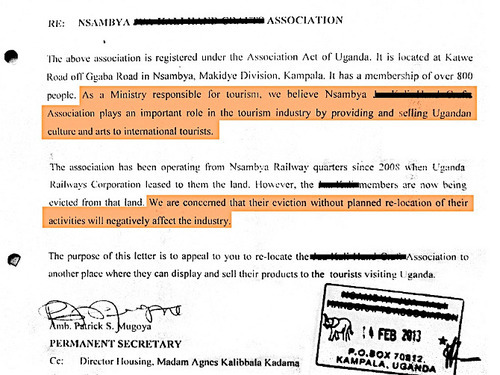 The Ministry of Tourism sent a team to evaluate their work and wrote a letter to the Ministry of Land pleading their case. This stalled the eviction, bureaucratically, for two extra weeks. In the end, the community was evicted on February 25, 2013. We decided to do a second map in hopes of recording the progress of the clearing. We also wanted to document how the lack of support during the eviction had displaced the previously flourishing market to a side street and create a stark contrast between the before-and-after. Using this new map, The Craft Market wanted to advocate their case and get support to relocate to a better location. After revising this tool for stalling, I realized that while useful to make counter arguments, it failed to recognize the community's collaboration or expertise. 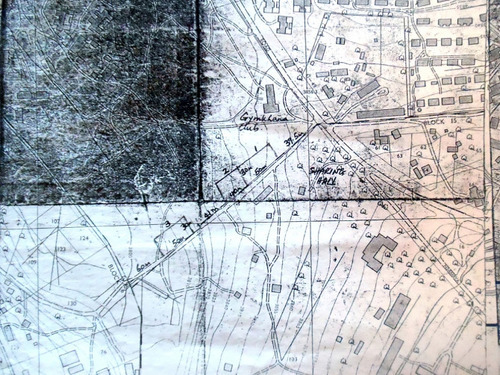 By being a polished and finished photographic map, it used a representational value that the state can acknowledge, but left no space to present their own hand drawn map or a systematic investigation. This image is a personal exercise of me as an outsider creating the graphic and is not a graphic created collaboratively. The layered image is a first attempt at incorporating their contribution in the graphic-map aspect of the research. Corporate Level: The first layer is the Google maps image and represents the market with only the aluminum stalls. Google, as a foreign global institution, is shaping our perception of the actual size and impact of the market. Google is making claims on the geographic boundaries of the space by naming buildings and marking roads. The ideas behind the credibility of photographic representations and the prestige of the institution render this map as the most important source to what was physically in the space. Community Level: The second layer is the hand drawn map done by the community. By being the experts on the ground, they mark on the map what was relevant to them. Collaborative Counter State Level: Through a workshop of balloon mapping, The Craft Market and I amplified the resolution of their hand-drawn map to level the playing field. Counter-Corporate Level: Feeding the map back into an open source GIS, the community was able to shape the way they were being represented and made their own boundary claims online. Erasure Level: Stripping the land suggests the presence of the new owner and the new owner's workers who are making preparations for a new phase in that space. Dismantling the stalls behind hidden tall metal fences hints to the erasure of the previous occupants. Nothing is left of their presence, their memories, or of how they had impacted that space. Thanks and hope you enjoyed! I'm sorry for the eviction of Craft Market. The project itself is amazing, and your imagery is crystal clear and astonishing! I liked the layering graphical explanation a lot. It's also very encouraging to see that the people there chose the use of maps and documenting this area as part of their struggle. You were quicker than I am with my emails. Thanks for finding and posting it! Powerful work. Excellent example of use of these tools.